How do I retain the ID3 tags of the converted DRM files? Due to the properties of video formats, you can retain the ID3 tags of specific file types, like MP3, WMA, M4A, M4B and M4P files if you convert them to the MP3 or WMA format. You can also retain the ID3 tags of WMV, ASF, and M4V files if you convert them to the WMV or ASF format. The software only acquires the ID3 information after completion of the conversion. Once the file has been converted, you are able to them get the ID3 tags for the output file. If you have chosen the correct output format and are unable to obtain the ID3 tags, contact us and let us know the format of your source file, and the output file. Also include a detailed description of what you were doing so that we can investigate for you. How do I transfer converted or downloaded video to my device? Wondershare UniConverter (originally Wondershare Video Converter Ultimate) supports transferring your converted or downloaded videos to your iPhone or Android mobile device. The following steps will explain the process to transfer the file. 1. Open Wondershare UniConverter (originally Wondershare Video Converter Ultimate), and go to the Transfer tab on top. 2. Connect your device with a USB cable. 3. Click on Add Files button to add files. To add folders, click the up down arrow next to Add Files and select Add Folders. 4. Click Transfer All button to transfer all files into your connected device. Or click Transfer button on the end of the video to transfer that specific video. 5. The transferred files then can be found on your device's default Videos/Music app. What can I do to play a video on my DVD player? 1. Check the official webpage for your DVD player to see what formats it supports. 2. Load the source file into the software and choose the best format that is supported by your DVD player in the Output Format section on the right of the window. 3. Upon completion of the conversion, plug a USB cable directly between the DVD player and the computer and play back the video. 1. Click on the Burn tab, and then click Add Files to load the video you wish to burn. And on the top right corner, under Burn video to, select Disc. 3. Choose the correct TV Standard for your country. Follow this link to view one that works for your country:https://www.videouniversity.com/articles/world-wide-tv-standards/ . Depending on your location you will choose either PAL or NTSC. 4. Click Burn to start the burning process. 5. When the burn has completed, you can now play the disc on your DVD player. There are three main television standards used throughout the world: NTSC, SECAM and PAL. NTSC and PAL are the most commonly used ones. 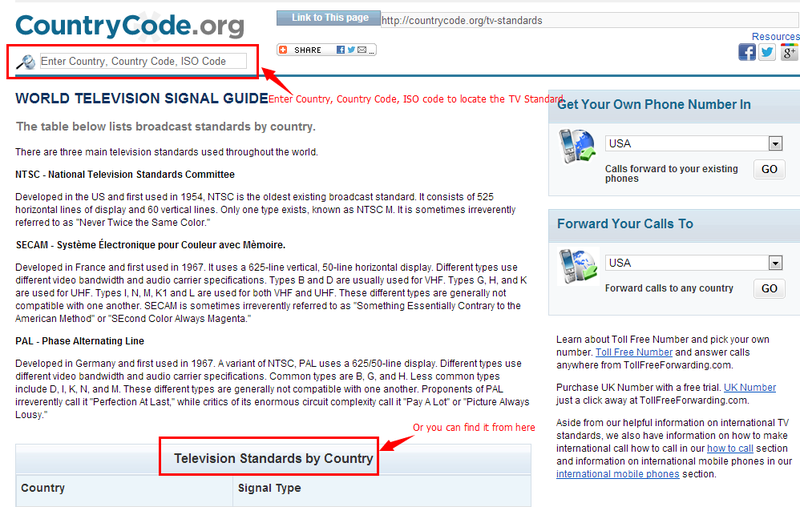 After clicking above link, you will see the page as below, then you could find the TV Standard by Entering country, Country Code, ISO Code or checking the Tablet directly. 1. Go to the Burn tab. 2. Drag the source video into the program. 3. Select the right TV Standard on the right side. The burned DVD will not play on your DVD player if the TV Standard is not correct. How do I cast video to TV? Wondershare UniConverter (originally Wondershare Video Converter Ultimate) supports streaming video to your TV using many different popular streaming devices. 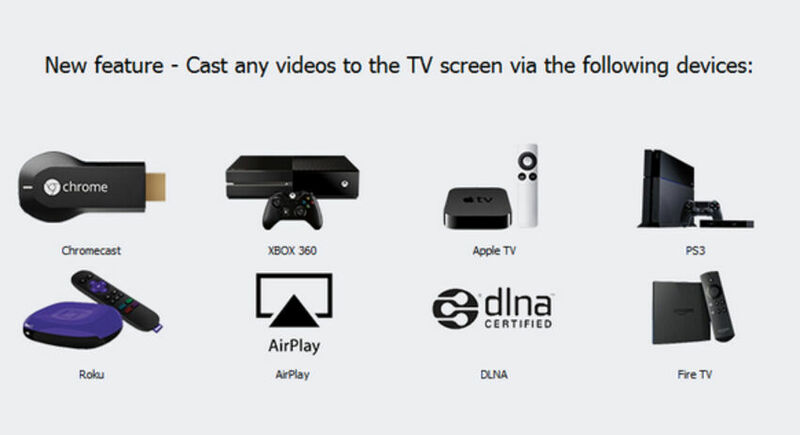 The steps below will allow you to setup your streaming depending on the device you are using. 1. It supports the following devices shown below. 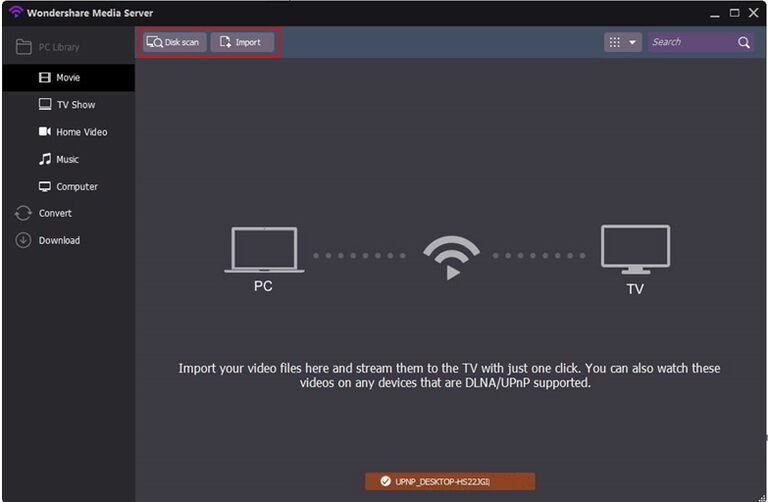 To be able to ensure smooth transfers you need to make sure both your PC and chosen streaming device are attached to the same network (LAN/WIFI). 2. 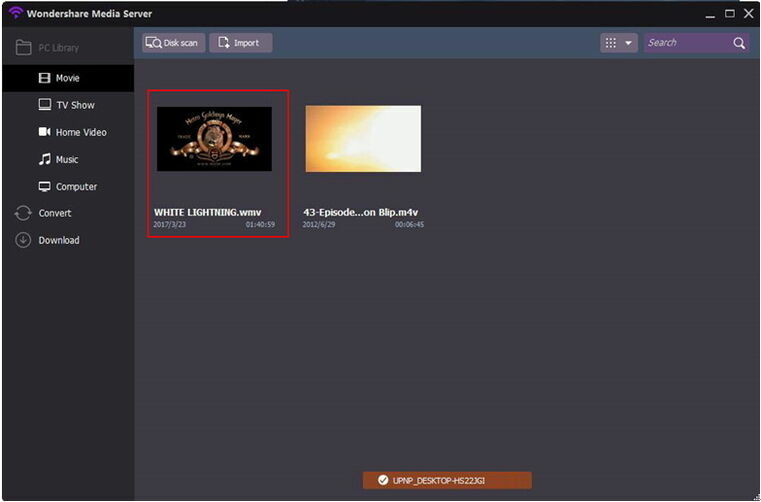 Click on the Toolbox > Cast to TV, it will automatically search the network (LAN/WIFI) for available devices to connect to. 3. 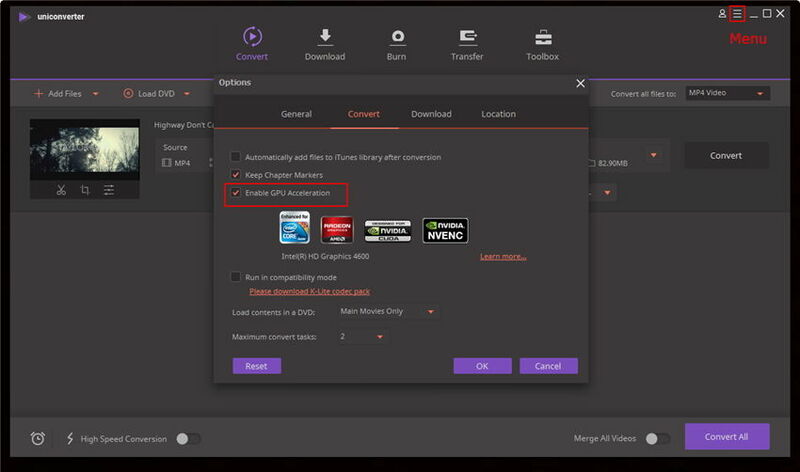 Once you have connected, click on Disk Scan or Import to load the videos you want to stream. 4. After loading your videos, choose one and send the video to the TV to view. 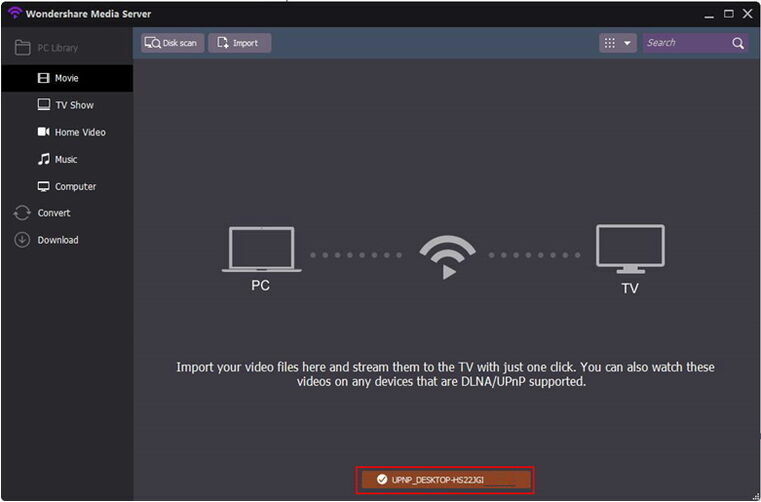 Note: If you are running a Smart TV, and it supports the DLNA protocol, you will be able to follow this guide to stream directly to the TV. GPU encoding allows the product to use new NVIDIA® CUDA™, AMD® and Intel® Core™ technologies to convert any DVD and common videos in all popular formats 6 times faster. Click Start > Run and enter "dxdiag". Click OK to open the DirectX Diagnostic Tool window. You can check the type of the graphics card (http://www.wondershare.com/topic/gpu-optimization.html#part1 ) and its driver under Display tab. 4) Choose a needed format from Target section, and click the Edit button to choose a H.264 encoder under Video Encoder. 5) Click the Convert button to start the conversion. After the conversion, you can go to the Converted tab to find the output file.